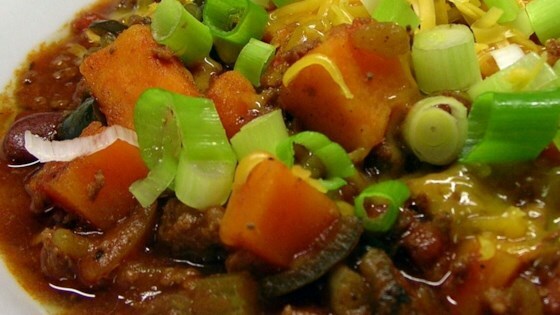 "A delectable, southern winter dish that warms the heart and fills the tummy! Garnish with chopped avocado if desired." Place sweet potatoes, stewed tomatoes, tomato sauce, onion, celery, water, chili powder, cumin, cinnamon, salt, black pepper, cayenne pepper, garlic powder, and onion powder in a slow cooker. Cook on high, stirring occasionally, for 5 hours. Heat a large skillet over medium-high heat and stir in ground turkey and ground beef. Cook and stir until meat is crumbly, evenly browned, and no longer pink, 10 to 15 minutes. Drain and discard any excess grease. Add cooked ground turkey, cooked ground beef, black beans, and corn to sweet potato mixture in the slow cooker; cook until flavors have blended, 1 to 2 more hours. Serve warm. Way too much cinnamon, and not enough of the savory spices. If I were to make again, I would cut back on the cinnamon and turn up the heat/spices. Used all ground beef and omitted cayenne for the kids. Served with chopped avocado, green onions, and sour cream. The entire family ate it up!